Just a bunch of photos from my walk around the (almost) complete new Queen's Quay. The short version of Queens Quay: Previously: old and busted. Now: new hotness. It was previously an uninspired, ugly and unfriendly. It is now stunningly beautiful. Really. Oh. And a bunch of CN Tower photos. Because why not? 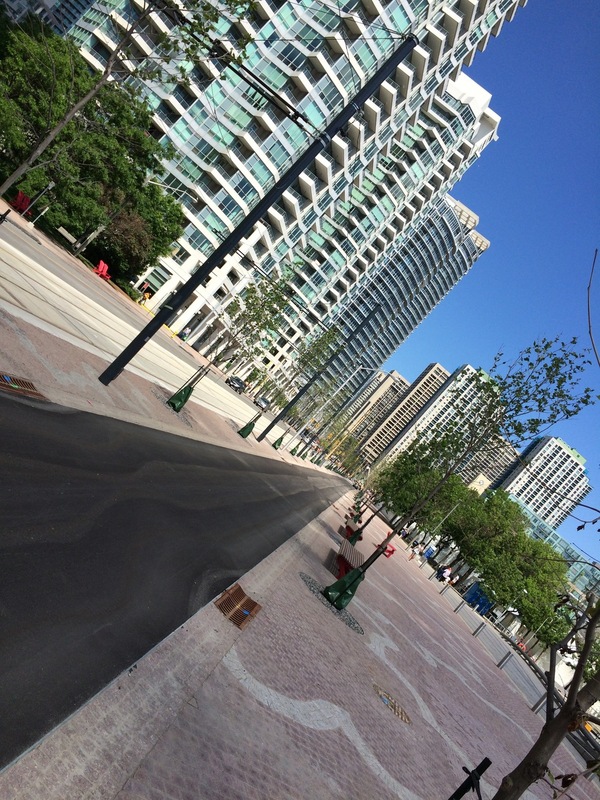 The new Queens Quay featuring wide sidewalks, and bike lanes. Simcoe Wave Deck as seen from the new Queens Quay. CN Tower as seen form Harbourfront. West jet stage in foreground. Toronto Harbour as seen from Harbourfront looking out towards Toronto islands. The brand spanking new Queens Quay, and brand spanking new streetcar! The brand spanking new Queens Quay Bike Lane! The brand spanking new Queens Quay! CN Tower hoping out of some trees. CN Tower as seen from between two buildings.